For Leo Messi, life has been all about scoring goals. It’s something he’s been doing non-stop from the time he was a little kid in his native Rosario and through to his superstar adulthood in the shirts of FC Barcelona and Argentina. 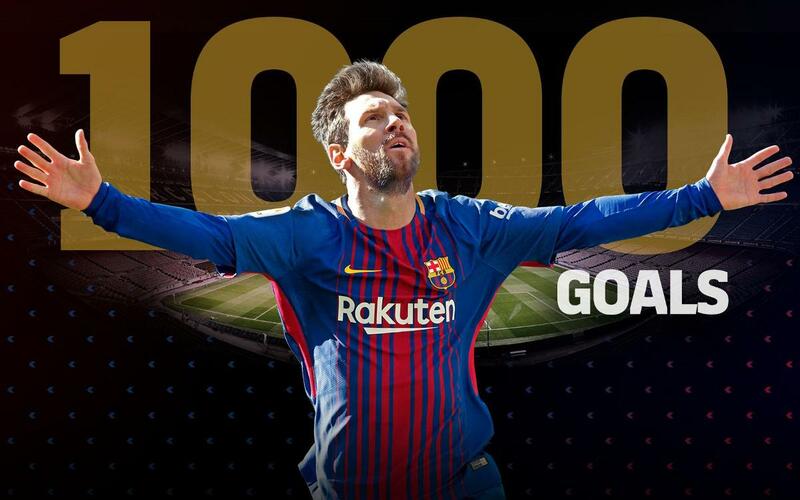 And his sensational hat-trick in the league-winning 4-2 win at Deportivo last Sunday also marked his 1,000th goal as a footballer. Born 25 June 1987, Lionel Andrés Messi Cuccittini joined the Malvinas Argentinas football academy at his hometown club of Newell's Old Boys in 1994, scoring four goals on his debut in April of that year, two months before his seventh birthday. As part of a generation dubbed The Machine of '87, he’d go on to score 234 goals for the team before being brought to the Barça’s La Masia academy. He started out with the U13 team, and progressed all the way up through the ranks to Barça B, adding another 105 goals to his account in the process. He’d eventually start getting games for the first team, and on 1 May 2005 against Albacete, with a deft chip following an equally brilliant assist from Ronaldinho, he claimed his first senior goal. Since then, with 583 goals in 687 appearances (including friendlies), he has gone on to become the highest goalscorer of all time for the famous club – and to be regarded by many as the finest player ever to grace the game. The rest of Messi’s career goals have been scored for his country, Argentina, for whom he is also the all-time highest scorer with 61 goals in 123 games – helping the albiceleste into two Copa America and one World Cup final. He also scored 18 goals for the U20 team, who he helped to a world title in 2005, and another two for the Olympic team that won gold in Beijing in 2008. He’s also scored at least 23 goals in charity matches, but these are not included in these statistics.